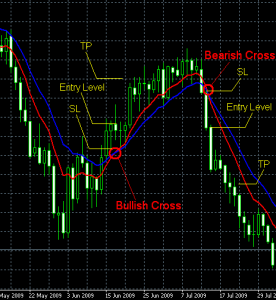 MA Cross Forex trading strategy — is a simple system that is based on the cross of the two standard indicators — the fast EMA ( exponential moving average ) and the slow EMA. 1. Easy strategy to follow. 3. It’s easy to set StopLoss. 4. Moving averages are laggy — can lag up to 10 bars. 5. Ineffective during the flat markets. - Any currency pair and timeframe should work. - Add an exponential moving average to the chart, set its period to 9, apply to Close, set color to red ( optional ) — this is your fast moving average ( FMA ). - Add another exponential moving average to the chart, set its period to 14, apply to Close, set color to blue ( optional ) — this is your slow moving average ( SMA ). Long position: Enter Long position when FMA crosses SMA from below. Short position: Enter Short position when FMA crosses SMA from above. StopLoss for Long positions should be set to the Low of the last candle before the cross occurred. For Short positions — to the High of the last candle before the cross. TakeProfit should depend on the StopLoss and should be not less that StopLoss. 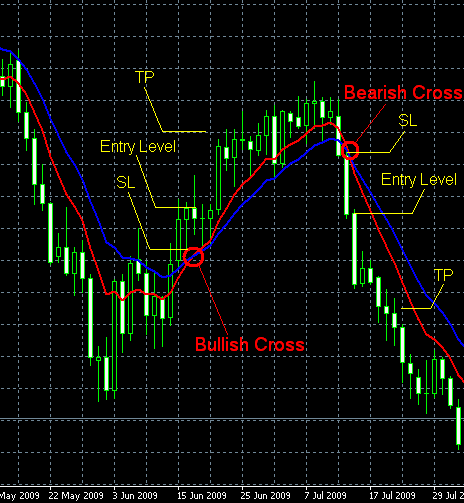 If another cross appears before the StopLoss or TakeProfit are triggered close the position.